The City of Oglesby and the Illinois Valley is ideal for new business and the relocation or expansion of existing operations. With many sites and a number of buildings available currently, with infrastructure in place and in close proximity to interstate, rail, barge and air, The City of Oglesby makes for excellent business opportunities. Many incentives are also offered through Enterprise Zones and Tax Increment Financing (TIF) districts. With low taxes, ample work force, job training and low crime rate – doing business in the City of Oglesby is the right choice to make. Currently, Oglesby has two TIF Districts in place: TIF I and TIF V. The City is currently in the process of developing another TIF (TIF VI) which will include land recently annexed into the city. The increase in real estate taxes from their current level to the assessment after the business has completed all improvements is the increment we use to calculate the reimbursement. That increment is then split (level to be determined) annually between business partner and the City. TIF eligible costs are established prior to the agreement, and the city continues to reimburse the business each year until that total is met or the TIF expires. At the end of the agreement, the business may not have received all the TIF eligible costs. The City does not guarantee that all the agreed upon costs will be reimbursed. 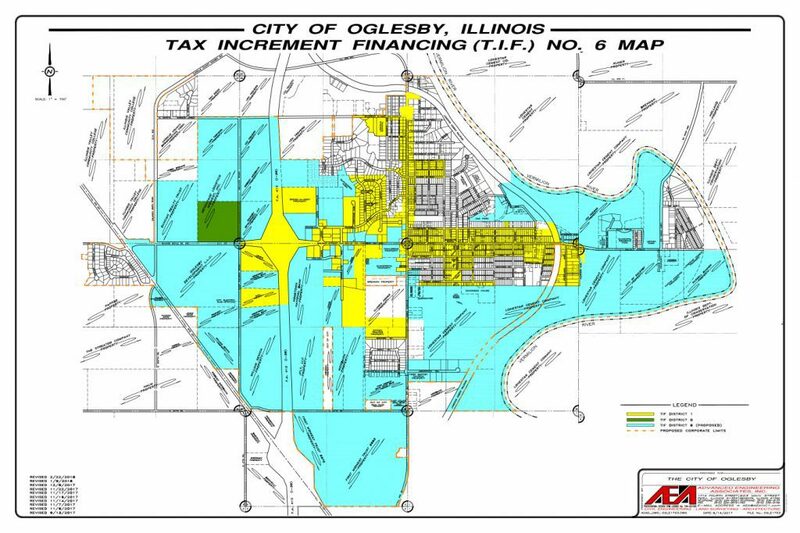 Most of Oglesby’s development properties are located in a Tax Increment Financing district or an Enterprise Zone. To see a listing of available parcels. The EDGE program is designed to offer a special tax incentive to encourage companies to locate or expand operations in Illinois when there is active consideration of a competing location in another state. The program can provide tax credits to qualifying companies, equal to the amount of 50 percent of state income taxes withheld from the salaries of employees in the newly created jobs and 10% of eligible job training costs of new fulltime positions. New job creation in areas deemed “underserved” can receive an additional 25% of Illinois payroll withholding tax of newly created fulltime jobs if certain criteria is met. Nonrefundable credits can be used against corporate income taxes to be paid over a period not to exceed 10 years.